Here's some propaganda for your Chrissie stocking. Eat your goose while listening to people who wanted to cook yours. 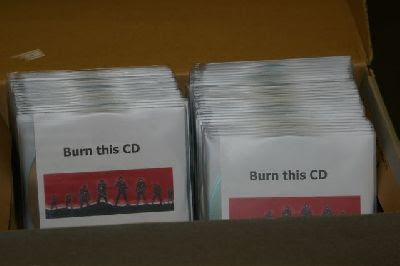 Saturday marked the launch of a CD set entitled ‘Burn this CD: responses to October 15’. The two CD set includes the voices of poets, writers, activists and people directly affected by the police raids around the country on October 15. The raids directly attacked the village of Ruatoki in Tuhoe country, invading homes and holding people captive while being interrogated. The CD was a way for many people to put their feelings and analysis into words. It contains a wide range of voices such as activist and artist Tame Iti, writer Hinemoana Baker, VUW lecturer and writer Maria Bargh, Kanaky activist Susanna Ounei , Pala Molisa and poet Teresia Teaiwa. 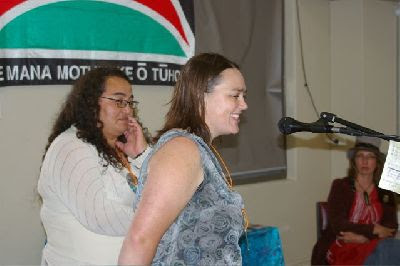 The two women organisers of the CD, Maraea Rakuraka (Ngati Kahungunu, Tuhoe) and Alice Te Punga Somerville (Te Ati Awa) also perform on the CD. The kaupapa of the CD is commodity free. It cannot be bought or sold. The idea is to get the ideas and messages out. The launch party was a mix of readings, singing and enjoying good kai.